Regulars at “The Clachan” in Paisley Road West have been watching with interest the work being carried on next door to their favourite howff for the past six months. The Bothy’s speciality will be grills with starters like prawn cocktail, or soup. 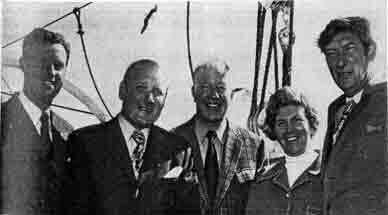 There will also be a “Chef’s Special.” The main entrance to the Bothy is from Paisley Road West, but there is also an entrance to the dining-room from the Clachan Lounge. 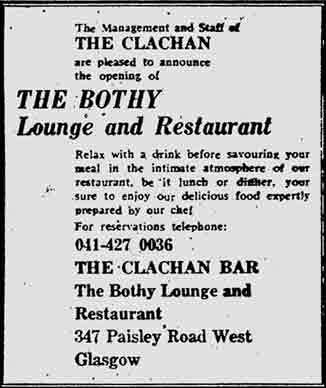 Although the Clachan does bar snack’s the addition of the Bothy will undoubtedly mean a better service for regular customers and will also encourage others to leave the attractions of the city centre for Paisley Road West. 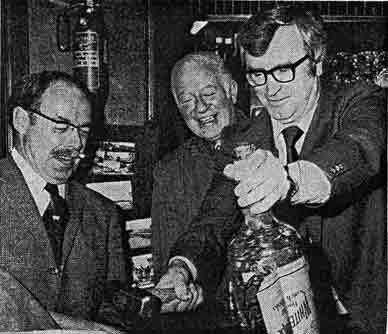 Rangers Manager Jock Wallace had a “smashing” time at Watson Morrison’s Clachan Bar in Paisley Road West, Glasgow, when he opened a gallon bottle in which more than £81 had been collected from customers by head barman Charlie Ruxton and barmaid Greta Palfrey. Of that amount, £12,500 has gone to many charities, helped to purchase two Variety Club Sunshine Coaches and paid for the installation of a kidney machine in Glasgow’s Stobhill Hospital. My Dad worked there,part time 60s and 70s right up till he died suddenly with a heart attack,big part of my childhood and had a few pints there when I was old enough.